The Fabled Pandaren Pet Supplies is a reward for completing the daily. This bag also has a chance to drop two other panda companions—Snowy Panda and Sunfur Panda. Hurls rocks at the enemy, dealing up to 630 Elemental damage. Rocks continue to fall on the enemy's current pet, dealing 118 Elemental damage each round for 3 rounds. Starting to love this pet, didn't care much for it durint 5.4. Scratch will really hurt undead. Rock Barrage hits really hard, especially on mechanicals. I guess the extra cooldown round is an excuse for it to hit a bit harder. I go with Burrow for avoid and huge damage vs critters, but Mudslide migt be useful if you want to switch weather. 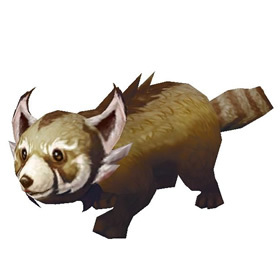 The Mountain Panda, thanks to Rock Barrage, easily destroys Decoys and punishes mechanical pets. But it is still a beast pet so be careful. Got my mountain panda on my first day doing the dailies. I'm delighted to get the Mountain Panda on my very first round of the Legendary daily, along with (gasp!) a Flawless Battlestone. I am hoping it will fund my mammoth. Just got this little bugger today along with an Undead Stone. I now have 3/4 Panda's with only the Snowy to go. They seem to sell for a lot on the AH, but after only completing this daily 5 times and getting the Mountain and Sunfur panda already, I don't think they're as rare as the AH prices suggest. Got him along with a Humanoid Battle Stone out of the Legendary daily first day. Has some new pet talents that turn out to be a lot of fun in pet battles so he's a good one to level. got this guy out of the fabled panderen pet supply bag for doing the fabled daily. yes you can cage and sell/trade them. The fur color matches that of the dark brown-colored pandarens. If only they had a stub tail they'd be twins! Cousin to the Snowy Panda, Mountain Pandas reside in the lower regions of Kun-Lai Summit.